Mike Helke grew up in Minnesota’s St. Croix Valley, where he still resides and maintains a studio. In addition, Helke is an assistant professor of art/ceramics at the University of Wisconsin-River Falls. 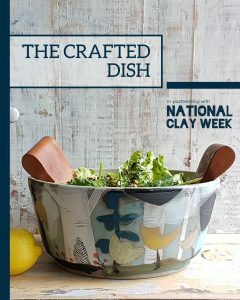 He received his MFA from the New York State College of Ceramics at Alfred University, NY. Application info – Click here to apply! last week to apply for Red Lodge Long Term Artist in Residency!!! (September 1 – July 31) up to one additional year renewal. This Residency is ideal for committed individuals interested in pursuing the development of their professional artistic careers through an immersive experience as part of the Clay Center community. LTR’s are awarded on an initial one-year commitment with the option for a second year renewal. Individuals searching for the time, space, and resources needed to explore new ideas and create work will enjoy our friendly community and the rural mountainous setting. 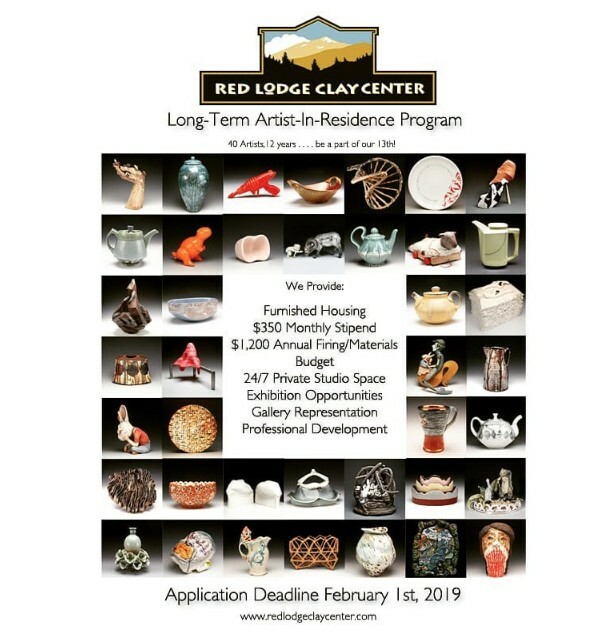 Accepted residents will be provided numerous financial and professional benefits including a monthly cash stipend, annual material & firing budget, 24/7 access to a private studio space, housing, as well as exhibition and networking opportunities in exchange for 20 hours of work per week at the Clay Center. 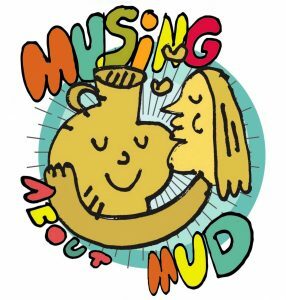 Responsibilities will include assisting in the retail operation of the gallery, teaching community clay classes, as well as cleaning and maintenance of the studio and gallery. Residents will be responsible for personal living expenses such as travel, groceries, personal vehicles, etc. Visit our Facilities page to learn more about the gallery, Resident Housing, and Fox Studio. Click here to see some of our former Long-Term Residents. We accept applications from emerging, to post-bacc, post-graduate, and artists with equivalent educations. RLCC requires that applicants be at least 18 years or older, have a valid US driver’s license, a reliable vehicle, and have the knowledge and experience to work independently in the studio. In addition, we ask all RLCC Residents to be part of our active and vital community; this includes interacting with Clay Center customers, Visiting Artists, Staff, and fellow residents with a professional and courteous demeanor. International applicants are welcome to apply, but must meet the above requirements as well as any necessary immigration visa requirements in accordance with current US laws. RLCC will provide a letter of sponsorship and limited logistical support, but International applicants will be responsible for securing the required Visa/work permit and any related costs incurred. All Long-Term residents will receive year-round housing (free of charge), fully furnished, which includes all utilities and off-street parking. LTR lodging is a large house, the “Salmon House”, with three individual apartments, two single-occupancy and one double-occupancy. Residents will be assigned to individual apartments or the top-floor shared apartment depending on availability and/or individual circumstances. Please keep in mind that there is a strict, “no pet” policy for all RLCC housing and studios. The “Fox Studio” is RLCC’s Resident and Staff studio facility which boasts a variety of kilns, equipment, and individual studio spaces. It is located 6 miles north of town making an individual vehicle necessary for each LTR. Each resident will receive a personal 10×12 (120 sq. ft.) studio space as well as access to the larger communal space. 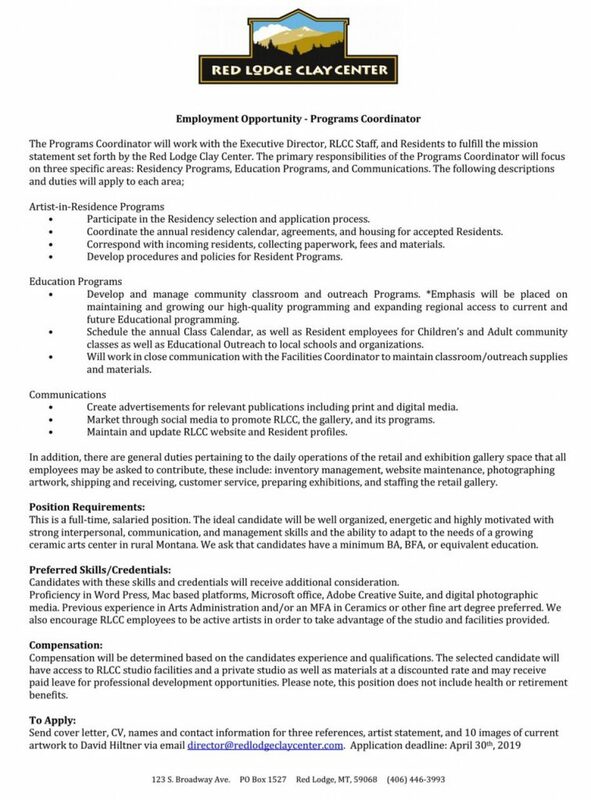 Red Lodge Clay Center is pleased to announce a search for the full-time position of Curator & Gallery Coordinator. This individual will work closely with the Executive Director, RLCC Staff, and Residents to fulfill the mission statement set forth by the Red Lodge Clay Center. About the Red Lodge Clay Center: The RLCC was established in 2006 by Executive Director, David Hiltner. The Center’s residency programming, contemporary gallery, and education-based mission are nationally recognized in the field of ceramics and continue to grow every year. The community of Red Lodge is a small, rural town in south-central Montana with a vibrant tourist-driven economy nestled on the edge of the Beartooth Mountains. We are in close proximity to some of the greatest natural beauty in the US including National Parks such as Yellowstone, as well as pristine rivers, mountains, and a myriad of outdoor activities. We are dedicated to fostering the success of our employees through their own professional practice as well as through the collective effort and dedication of the Clay Center’s mission. Minimum Qualifications: Candidates should have knowledge of contemporary ceramics, an active studio practice, and previous gallery/curating experience. 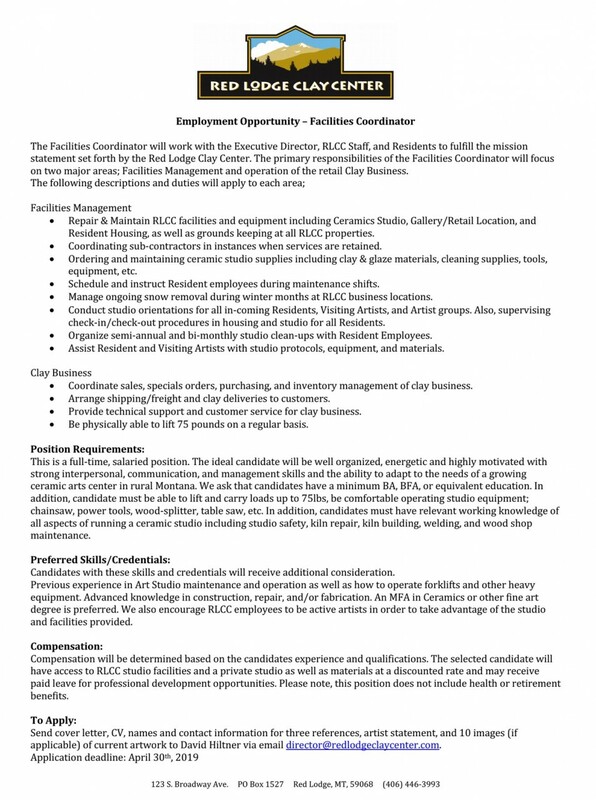 In addition, we expect candidates to have the necessary interpersonal/communication skills and organizational capability to manage our Resident workforce, as well as maintain excellent relationships with our clients and artists in addition to the other duties required of the Curator & Gallery Coordinator. Preferred Qualifications: MFA, prior sales/marketing experience, proficiency in Adobe Suite and online sales platforms (Shopify) as well as WordPress and Microsoft Office. Also, prior experience and proficiency with digital photography and photo editing is desired. In addition, we are interested in candidates that are able to develop and implement a short and long-term set of goals and strategies for the continued success of our Retail and Gallery spaces. 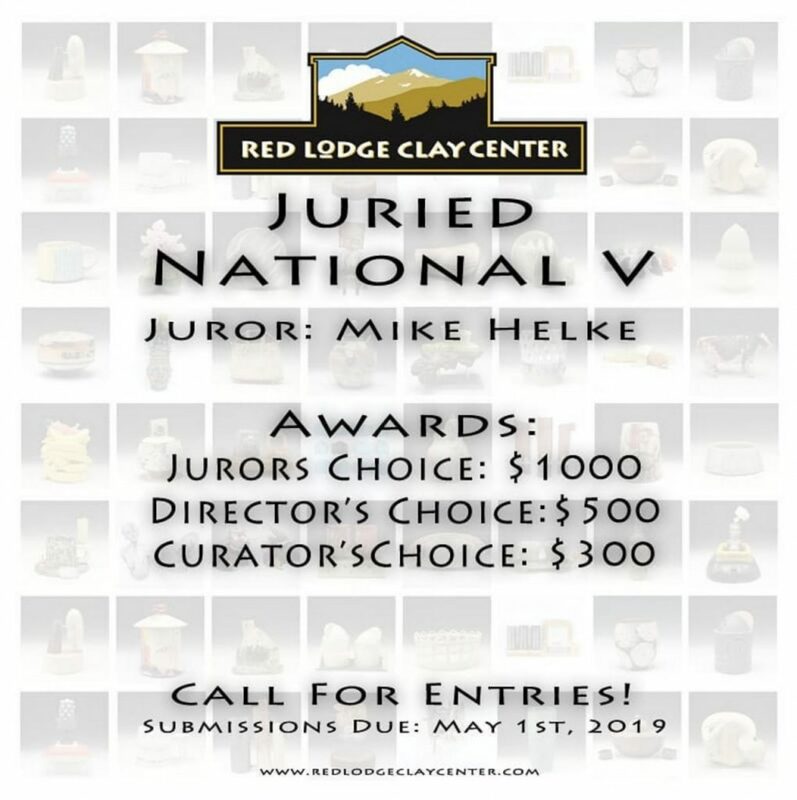 Send cover letter, CV, names and contact information for three references, artist statement, and 20 images of current artwork, as well as writing/curatorial samples (3 Exhibition proposals and accompanying press release) to David Hiltner via email at director@redlodgeclaycenter.com. Application deadline: January 31st, 2018 Applications will be reviewed on upon receipt. Starting annual salary commensurate with experience. Other benefits include: private 24/7 studio space, Discounted materials/Firings, paid leave for professional development, as well as being part of a strong community of makers and artists.